It’s been over a year since I went to my first TeachMeet, up here in Brisbane. I presented a pecha kucha on ‘fair’ assessment and Project Based Learning and had a great time meeting a bunch of other educators from a wide range of contexts. Now the time has come for me to donate space at my institution to the cause. Each semester I endeavour to arrange an activity that puts my preservice students in touch with teachers and practitioners in ‘the real world’, and this semester the TeachMeet will be that event! When I asked my students a few weeks ago if they were keen to act as hosts for this event they were really into it the idea and the planning (mostly of potential snacks) began straight away. Our theme is ‘What Works in Education?’, which doesn’t really narrow the focus too much but is intended to get people interested in sharing good ideas. 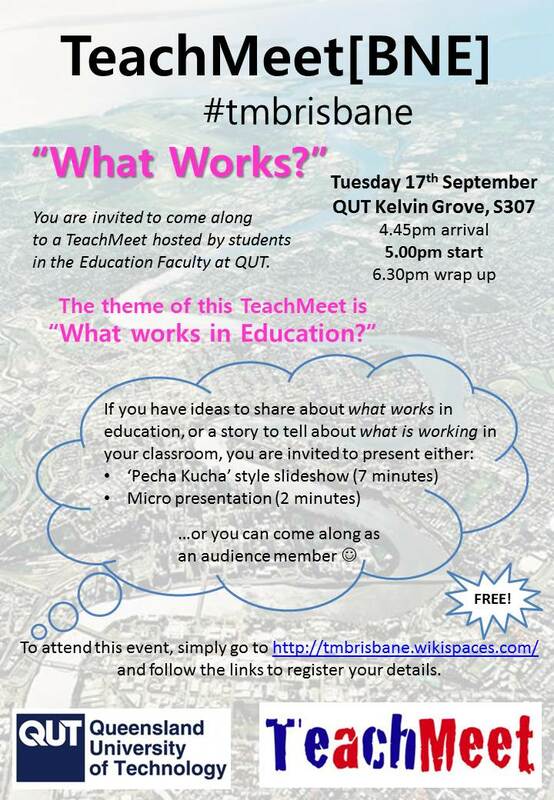 If you follow this blog and live in Brisbane we’d love to see you at our TeachMeet!